Childbirth is a beautiful part of life, but pregnancy does change a woman’s body. Many women who are pregnant (or plan to be) worry about the inevitable weight gain. When you’re pregnant, you don’t have to abandon your usual fitness regimen. In fact, regular exercise during pregnancy has benefits for both mom and baby. Some weight gain during pregnancy is healthy. Exercise can help women adapt to that weight gain, and also make it easier to get back in shape after childbirth. It’s even suggested that labor is easier for women who maintain fitness throughout their pregnancy. 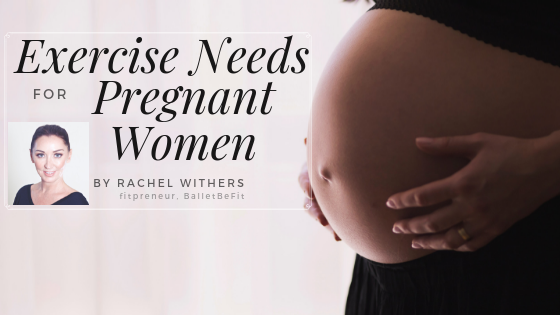 It’s an old myth that exercising while pregnant is dangerous for the baby. The opposite is true. Regular exercise during pregnancy can reduce the risk of complications, such as hypertension and pre-eclampsia. At the first maternity appointment with your healthcare professional, make it a point to discuss your exercise routine. Your provider can help you modify exercises as your pregnancy progresses, offering advice specific to your needs. Generally, your exercises during pregnancy will vary based on how active you were before pregnancy. Recommended exercises often include walking, jogging, swimming, yoga, pilates and exercise classes tailored to pregnant women. To avoid injury and complications, let your body guide you. You should be able to talk normally throughout your exercise. If you’re sweating profusely and exhausted, that’s a sign that you need to lower your intensity level. Pregnancy naturally raises your body temperature and heart rate, so you should be conscious of exercising in extreme heat, when ill, or with extreme intensity. It’s advised that pregnant women avoid heavy lifting, significant changes in pressure or altitude (SCUBA diving or altitude training), and exercises that involve lying on your back. Women should also avoid any exercises that could lead to falling or abdominal trauma. If you experience chest pain, headache, dizziness, vaginal bleeding or difficulty breathing, stop exercising immediately and consult your healthcare provider. Exercise is important for pregnant women, but safety should always be the top priority. Expect that you’ll have to modify your regular exercise regimen further into your pregnancy. After giving birth, you’ll likely need to ease back into your exercises to minimize the risk of injury. Life can be hectic when you have a newborn, but many women find that making time for their workouts can help both mind and body after childbirth.